The maximum distance is 120 m / 400 ft with the help of the target lens with zoom function, the distance attainable in practice increases significantly even with brighter light. The GLM 400 CL is sold in Europe as GLM 120 C Professional. The 120 symbolizes the maximum distance in meters as the 400 stands for feet. Some of the photos show the GLM 120 C – regarding the specification we found nearly any difference. The GLM 400 CL Professional laser distance meter simplifies many measurement tasks and makes work more efficient. Of course, the device can be used indoors, but the main advantage comes into play when used outdoors. With the help of the camera with target optics, external measurements are possible even under unfavourable, i.e. bright, conditions. 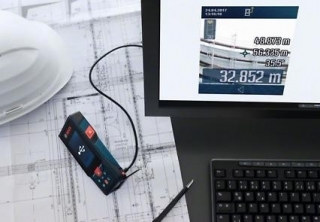 This makes the rangefinder suitable for a wide range of professions, in particular building related trades such as painter, carpenter, roofer or from landscape gardener to architect. 88 metres in summer, measured outdoors during lunchtime: Respect! We will soon be testing to see if even more is possible. Until now, it was difficult to detect the laser dot of a distance meter over long distances and in bright environments. This is where the GLM 400 CL comes in with the integrated camera: The user can use the camera and a crosshair on the display to focus precisely on the target point. This enables precise measurements even over long distances. The camera has a three-step zoom and 5 megapixel resolution. The GLM 400 CL can store around 700 such photos and shows the last 50 photos on the display together with the measured values taken in parallel. This allows measurements to be subsequently assigned and checked, and also allows work to be better documented. The photo on the right shows the documentation of a measurement from our test. As you can see in the photo above, the measurement was taken in June at 12.30 pm, i.e. at very high brightness. The distance was taken without a tripod and without using the timer function. The GLM 400 CL was only placed on one edge, but not in a stable position. We repeated the test under the same conditions with a competitor model that also has an integrated camera and therefore required more tests for a successful measurement than with the GLM 400 CL Blaze. These are probably favourable conditions for practical application. However, this is ultimately a consideration by the manufacturer of how much potential inaccuracy or incorrect results are accepted in order to be able to show the result of a measurement. Or to put it bluntly: How many measurement attempts with an error message does a user accept or is he more willing to accept compromises in accuracy but to get a result at all? These rhetorical considerations should by no means diminish the performance of the GLM 400 CL Blaze. 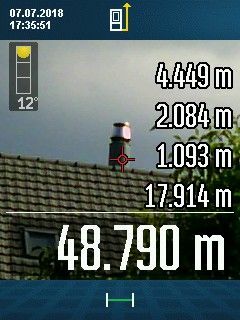 Under such conditions, a laser rangefinder without camera function would hardly have managed a measuring distance of 15 meters, because the laser dot would not be visible. The names of the “columns” in the first row are self-explanatory. Measured values can be transferred to the Measuring Master App via the Bluetooth interface. A variety of functions are then available in the app. Material calculations can be carried out, floor plans and plans of walls can be created and data can be sent digitally directly afterwards. With the help of the app, the GLM 400 CL can be remote-controlled, which in some tricky cases saves the support of a colleague or measuring assistant and also prevents shaking of the measurement. The Measuring Master app is available for free download from the Google Play Store or Apple App Store. The internal memory of the rangefinder records measurement results and camera photos. Via a micro-USB interface the photos can be read out on the PC as JPEG and the data as CSV list. The GLM 400 CL Professional is based on the simple operating concept using a selection wheel, which has already been introduced with the GLM 50 C and has convinced us in the test. With this selection wheel shown on the display, even the occasional user can find all functions quickly and very easily. Also less frequently used functions such as staking, with which you can quickly measure and then mark equal distances. This rangefinder is also equipped with a 360° tilt sensor. With it, inclinations can be measured and the laser distance meter becomes a digital spirit level. The GLM400CL Balze has an additional measuring button on the side with which the device can be switched on and off and a measuring process can be started. Even in tricky situations and in any environment a comfortable handling can be ensured and measurements are possible without or with less dislocations. 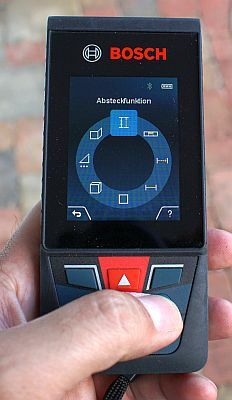 Selection of the functions via a rotary function on the display. The settings use the same operating logic. The new user interface offers professional users and experienced DIY enthusiasts help as animations or texts right from the start. 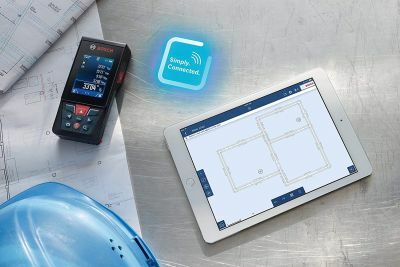 What competitors previously offered in the premium class is now also available from Bosch: The position of the measuring pin is automatically recognized and the measuring reference is automatically adjusted accordingly. This means that the GLM 400 CL recognises when the pin is fully extended in order to be able to measure from a corner. In this case, the user does not have to switch the reference manually, but a short confirmation of the change is sufficient. All these points help to avoid measurement errors and make operation as simple as possible. The new laser rangefinder shows the last four measurements and the current measurement result on the color display during the measurement. 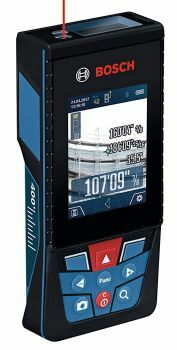 With 2.8 inch the display is particularly large and has an automatic rotation function similar to a smartphone or the GLM 50 C. This allows the values to be read in any situation and at any inclination. The display technology used also originates from smartphones: the LCD module is firmly connected to the glass surface. As a result, the light in the gap cannot refract and is not reflected. Because the display is clearly visible from any angle (even from the side), the readability is significantly improved. 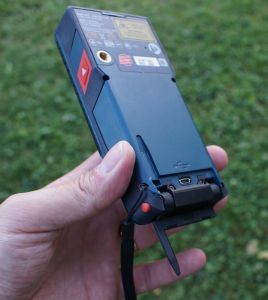 Bosch promises advantages over conventional laser rangefinders, especially in outdoor applications. Thanks to the resistant protective glass, the GLM 400 CL can also withstand tough use on construction sites. The GLM 400 CL Professional Blaze is now available. 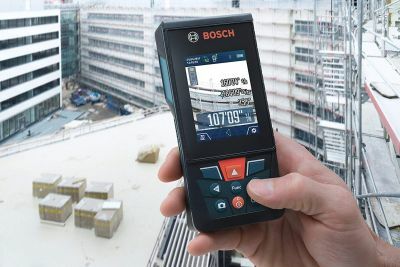 It replaces the GLM 100 C Professional and the GLM 150 Professional in the Bosch laser rangefinder program in the long term. One of the big surprises comes at the end: The recommended retail price in Europe is cheaper than the corresponding price of the GLM 100 C, i.e. the new significantly better Laser distance meter is priced more cheaply than its predecessor.